Marking its 34th year with the Theme Region – Wines of Chile and a Global Focus on Cabernet(s) – the Vancouver Playhouse International Wine Festival runs from February 27th to March 4th, 2012. The Vancouver Playhouse International Wine Festival is widely regarded as the best consumer wine show on the continent and this year’s event will bring 180 participating wineries from 15 countries. 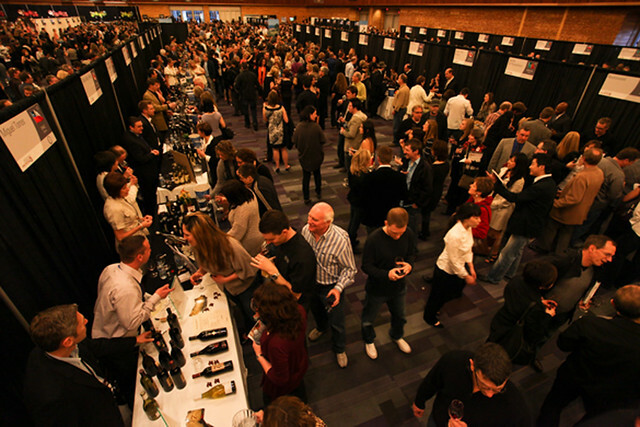 Expected to entertain some 25,000 wine enthusiasts at 64 events, the Festival will offer seven days of tastings, seminars, and wine focused minglers hosted at the Vancouver Convention Centre West. Although the weekend is packed with wine seminars, luncheins and industry events – nothing tops the Tasting Room where you can hop from country to country sampling over 791 different wines. Once you walk in, you’re handed an empty glass and given a license to start sampling! Everything is on display and nothing is off limits. Sample the very best of wine, port, rosé, sparkling, erlot, champaign and plenty more! Not a wine coneisseur? No worries! Each winery booth will give you the rundown on exactly what you’re tasting whether you’re a novice or a pro. Be sure to purchase your tickets in advance as many events sell out fast. This year the Pan Pacific Vancouver will be giving away 2 tickets to the wine tasting event on Thursday March 1, from 7 to 10pm. 2)	Leave a comment below and tell us why YOU deserve to go to this year’s festival (we’ll pick a random winner). OR	Do BOTH for an additional entry! *Winners will be selected Monday February 27 at 12 noon. Must be 19 years of age to enter and win. Photo ID will be required for pickup. Each year we remind all guests to never drink and drive after the Wine Festival – so be sure to plan your transportation in advance! 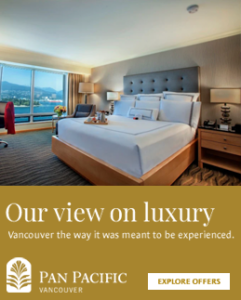 If you’re looking to make a night out of this special evening, The Pan Pacific Vancouver (which is footsteps away from the Vancouver Convention Center) will be offering offering hotel stays for $199 a night throughout the Wine Festival. 53 Responses to Vancouver Playhouse International Wine Festival 2012: Win 2 Tickets to the Show! My best friend and I are both big wine drinkers so we would love to win a couple of tickets to attend this wonderful event! I love me some wine and I enjoy trying new varieties and brands so I can impress my friends with recommendations/be a good hostess when company is over. But I’m broke which doesn’t bode well for someone who likes to experiment. Tickets to this event would be amazing! My gal pal and I deserve to go because we love wine and we’re trying to get out and meet new people! This could be a fabulous time for us! Combine my two favorite things? Wine and theater….that’s a win win! thank you for the opportunity to enter! My friends and I love to try different wines and would love to go to this event !! Growing up in Austria, wine and theatre are a big part of my upbringing. Winning here could show me, that that part of Austria is present here in Canada too. I would love to attend the festival. Had tickets for previous year but had to sell due to family emergency 🙁 definitely want another chance to go and winning tickets would be amazing!! I absolutely LOVE wine and will be going to this festival win or lose! Would love to take my daughter to this , we’ve been to some smaller events ,this would be GREAT! I deserve to go to the wine festival because I am a wine lover and have never had the opportunity to attend! I’ve never been to the Vancouver Playhouse Wine Festival and I would love to use this opportunity to sample wines from different countries and of different varieties. Where else can you find this many wineries in the same room?! Thanks for running the contest! My husband and I would love a nice night out trying wines from around the world!! I’d love to go, I’ve never been! My New Years resolution this year was to learn about wine and the countries they come from. What an excellent opportunity to make part of my resolution come true…all that wine in one place!!! That is the reason to send me!!! As a newbie to the wine world I love to try wine selections from around the world and local varieties and learning which wine goes best with chicken meat or pasta dinners. Tickets to this event would be amazing! Yes. I absolutely deserve to go since I have been off wine (all alcohol actually) for almost 2 years thanks to pregnancy, childbirth, and breast feeding!!! I am BACK to the civilized world of drinking and most definitely need to go to the wine fest to celebrate! My partner and I are keen about wine, both from Bordeaux we love trying different wines away from France. My friends are getting married and they need to pick their wine. It’s a very important task. I love wine! Will love to go! I’ve never been to a wine festival, not that I’m whining… but three weeks ago I tore my ACL ligament in my knee, and could really use some good news, like winning free tickets to a wine festival. I promote local events through a weekly blog but I don’t have the opportunity to go to as many events as I would like – plus I love wine! Oh boy! That sounds so fun!!!! Started enjoying wine this past year and would love to learn more and try new wine. I love wine & food pairing. I definitely want to learn more about it and also about wine for cooking. Also last year I found a Napa Valley wine I really liked in the festival, but then I was too reluctant to buy it and I regretted it as it was only available in the festival’s store. So I wanna come back and check if they have it again this year and buy it! My sister just got a new job and I would love to treat her to this but just don’t have the shekels right now……so hope you pick me. Just learning about wines & would love to expand my palate. More knowledge about wine – it can never be a bad thing! OOH! So many wines! Always looking for different ones to try! Life isn’t worth living without wine! Because one of my favourite past-times is to drink wine while solving crossword puzzles in my rocking chair… and I’m only a 20-smth. One can never stop learning about wine…no better way than to drink it! I have a huge appreciation for wine (Chilean especially!) and would love to finally get out (been studying hard for weeks!) to socialze with a gf I haven’t had the opportunity to see in quite some time. I think it would be a perfect evening for the gals to catch up, unwind, and sample some unbelievable wine at our favorite hotel. Cheese, food & dessert pairing with Wine — Marinating with Wine –Cooking with wine — Wine-Infused Desserts. Wine filled chocolate truffles. My husband is from the wine region of New Zealand and we both love any opportunity to try new wines. More knowledge and tasting to develop my palate! Yum! I have never managed to score tickets for the Wine Fest, and would love an opportunity to attend! And the winner of two tickets to the Vancouver Playhouse Wine Festival is Kelvin Claveria from Twitter! @Kcclaveria! I’m really very excited that I won. Thanks, Rishad!